Hey y'all! So one of my big house goals for 2018 was to invest some energy into my bedroom space. I fell in love with my house from the moment I walked into the living room and onto the creaky old hardwoods, but my bedroom has always been a hard sell for me. 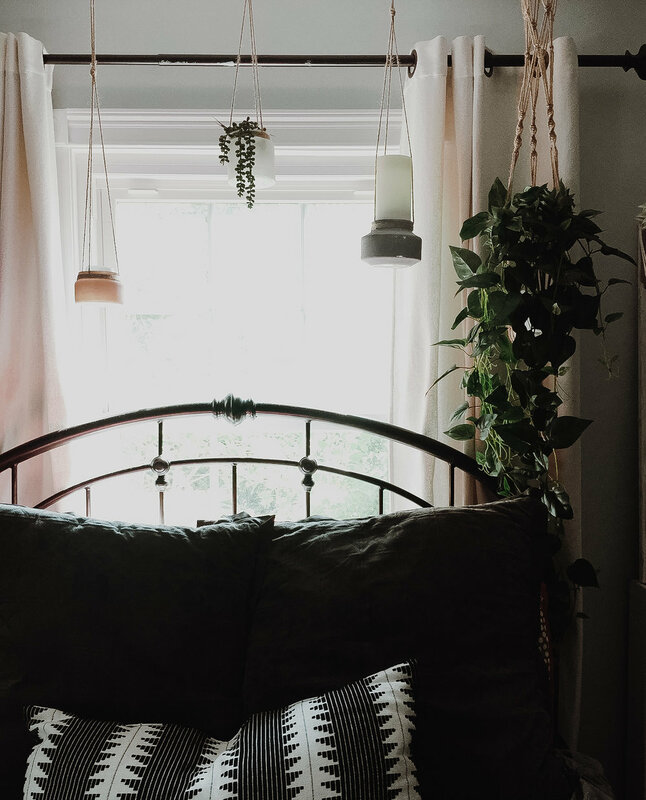 It wasn't until the last few months when I started really being intentional about what goes into my bedroom, where I wanted my bed to be, and really trying to give it a personality that its started to become one of my favorite spaces. I started this little collection of hanging objects along the window above my bed, and what started as TWO hanging woven plant holders few into those woven plant holders, plus two ceramic candle holders, plus two MORE ceramic candle holders, and two LED candles; but it still felt like the collection lacked any energy. I love the idea of plants, but I'm not so good at keeping them alive unless they're a member of the cacti/succulent family. But I felt this pull to add something green and leafy to my eclectic mix of hangings. So I was over the moon when Silk Plants Direct reached out to collaborate. With my lack of a green thumb, and recent entry into the world of crazy emergency room schedules, there was NO WAY I would have been able to keep a plant alive. But a silk plant – I had decided – would be the perfect way to add in that leafy energy I wanted without killing a poor, unsuspecting houseplant. The website has SO many kinds of silk flowers, and I spent a whole afternoon/evening looking through them to see which one I thought would fit best with my space. After combing through Pinterest to see what plants I liked for the "feel" I wanted in my space, I chose this silk philodendron as the product I would receive in exchange for this post! I love how the length of it brings the green all the way down from the ceiling, I feel like it works really well to bridge the gap between my hanging collection and my bed, and now I kind of want to get a second one for the other side. I love how detailed the leaves are, and love how the strands kind of curl at the end! They look so real! This is the link to the plant that I got, it's 44 inches long, and has multiple hanging strands that I kind of wrap around the iron of my bed frame, I feel like that gives it another level of "wild," especially since the ivy I'm propagating have entangled themselves together so much in my other room. The people at Silk Plants direct were also kind enough to provide me with a code y'all can use if you're looking for a silk plant of your own! Use BLOGGER10 to get 10% off your purchase. Note: Even though I received the product for free in exchange for this review, I wouldn't tell you guys if it wasn't up to my standards for what I wanted! I want you all to trust that if I write a review on something, you could try the product and have the same experience. And if you already trust my opinions on products, I wouldn't want to do anything to break that trust! Heading Towards an Effortless-Moody-Vintage-Parisian Aesthetic for my Bedroom. Sharing a little update of my bedroom, and the first steps I’ve taken to be more intentional about decorating this space! Finally finished my guest room project! Click to see how i tried to make this room a little less dark & dingy and a little more bright, fun, & balanced! Hi everyone! It has been a crazy few months. My floors are finally in and i'm in the process of moving furniture back !